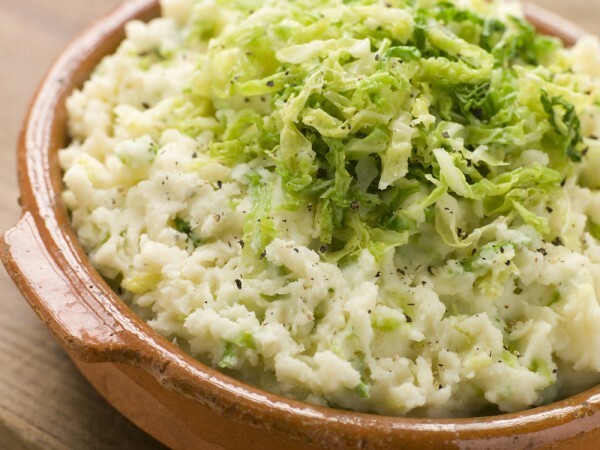 A traditional Irish dish of mashed potatoes with cooked cabbage stirred in, my dad introduced me to this long ago, and I count it among my favorite comfort foods. The addition of bay leaf and carrot to the warm milk adds a subtly sweet and savory undertone to the mashed potatoes. This is delightful served with grilled salmon with a mustard sauce, or with a frittata, or my favorite way to eat it is just as is for breakfast. Simmer bay leaf and carrot in milk, let steep. Bring a pot of salted water to boil and toss in cabbage leaves to wilt for about 5 minutes. Fish the cabbage out with a slotted spoon and place into a colander in your sink to drain. Add potatoes to pot and cook until just tender, about 15-20 minutes. While the potatoes are cooking, finely chop your cabbage and gently squeeze out any excess liquid. Drain potatoes when tender. Place potatoes in a bowl, and mash them with butter, strain the milk into them, add sour cream, salt and pepper to taste. Stir in cabbage and scallions. Serve hot.